What’s Buzzing? It’s the Hairy Crabs season again! We are always happy to be back at Hai Tien Lo for the limited time Hairy Crab menu, which is back this year from 17 October to 27 November 2016. There is a specially crafted six-course prix fixe menu and nine a la carte items this year to savour these seasonal crustaceans. The Highlights For a start, we had the Steamed Minced Pork Dumplings with Hairy Crab Meat and Roe, which redefined the way I look at Xiao Long Bao again. The pork dumpling had the right skin texture to contain the tasty flavours of the soup and hairy crab meat, which was a good teaser to start our hairy crab meal. One of the highlights of the meal is definitely the Sautéed Hairy Crab with Ginger Spring Onion in Chinese Black Vinegar Sauce, the first time we are trying this delicacy stir-fried with black vinegar sauce. The luscious golden roe aside which reminded us why it was worth the hassle of eating this crab, the black sauce and stir-fried method of preparation added that extra aromatic flavours to the crab. The other savoury dishes which left an impression on us are the Braised Hong Kong Kai Lan with Wild Mushrooms in Hairy Crab Meat and Roe, Stewed Udon Noodles with Fresh Prawns, Hairy Crab Meat and Roe and the Japanese Style Sea Perch Fillet in Sake Sauce served with Fresh Scallops in Pepper and Salt. Overall, I love how the rich and creamy hairy crab meat and roe complimented each of these dishes so well, and it was pleasant and convenient to enjoy the hairy crab meat in the sense that you do not have to work your hands hard to peel them off the shell yourself. 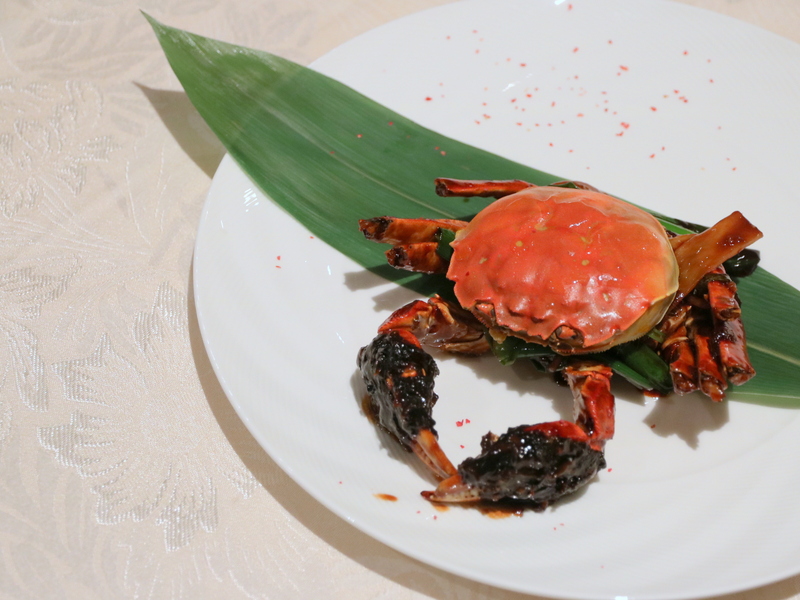 The seasonal Hairy Crabs are best paired with fresh ginger tea or wine to enhance its natural flavours. As part of the Decadent Hairy Crab Promotional Set Menu (S$168++ per person), we also tried the delicious Double-boiled Chicken Soup with Abalone, Sea Conch and Chinese Herbs and concluded our satisfying meal with the Chilled Bean Curd Pudding with Bird’s Nest and Avocado Cream. Can I also add that the Chilled Bean Curd Pudding at Hai Tien Lo is exceptionally good? I first tried it as part of the Dim Sum buffet, and it was still as good when I tried it again this time. Availability The Hairy Crab set menu and a la carte items will be available during lunch and dinner from 17 October to 27 November 2016. The six-course menu is priced at S$168++ per person, with a minimum of two diners required and a la carte items start from S$6.80++ per serving. Make your reservation instantly at Hai Tien Lo here. For more information, kindly refer to Pan Pacific Singapore’s website.